Australia is home to many talented established and emerging artists, and with the ever increasing popularity of social media and blogs it’s now easier to view the incredible artwork that’s coming out of this country. If you’re an artist or aspiring artist, you may become inspired and pick up some valuable advice by seeking out artists’ blogs. We’ve created a list of the best Australian art blogs to follow to help you get your creative juices flowing and motivated to pick up that pen, pencil, or brush. The Design Files is Australia’s most popular design blog, featuring all things creative including art, interior design, photography, craft, architecture, and more. The Art blog on the website features interviews and studio visits with some of Australia’s leading artists and galleries. Find out about new exciting talent, enter art competitions to win prizes, follow exhibition listings, and read about art award highlights from around the nation. One of the latest posts features vibrant sculptural work by Sydney-based artist Ramesh Mario Nithiyendran, whose ceramic art has been featured in the National gallery of Australia. The Art Pharmacy blog provides a collection of insightful articles, how-to’s, and interviews with local artists. The blog is carefully curated to showcase emerging Australian artists and provides affordable artwork for all art lovers to purchase. The best part is, if you purchase a piece of art from the website you know you’re supporting local artists; allowing them to continue producing work and encouraging emerging artists to break into the Australian art scene. Blog posts include guides on how to start an art collection on a budget, how a hotel lobby can spark your creative imagination, and an interview with Australian artist Meg Minkley on how art can be healing. An online art marketplace, Art Lovers Australia, also has an in-depth art blog. The site encourages emerging artists to share their work, and provides the casual art lover with an insightful collection of blog posts to help spark their imagination. Highlight posts include a feature on ‘street art’, what you need to know about gifting art, and Australia’s artistic identity. Popular independent magazine Frankie Magazine is a bi-monthly issue based in Melbourne covering all things art and design, photography, craft, and more. The magazine has its own blog that touches on topics covered in the print magazine, as well as exclusive competitions and interviews with Australian artists. If you’re looking for inspiration, new ideas, or simply just love browsing a range of different art-forms, then the Frankie blog is for you! Highlight articles feature how to pretty-up postcards using French knots, a conversation with artist Adam J. Kurtz on how to find your artistic voice, and an information-filled article about watercolour tattoos. Artist Profile is a quarterly journal published in Sydney featuring in-depth interviews with contemporary visual artists. This blog is particularly insightful for artists who are looking at taking their hobby further and breaking into the Australian art scene. The advice from experts are both helpful and extensive, linking to Australian artists’ social media pages and exhibitions. The essays provide feature pieces on unique artists and art forms coming out of the country, including an article on Indigenous printmaking, why regional galleries are in crisis, and an opinion piece questioning if artwork should be made to last forever in today’s ‘throw-away’ society. This informational blog provides a huge catalogue of stories, interviews, and exhibits from Australian artists and art alike. The Art Life is written as an anonymous blog with humorous articles and an interactive tour through the world of contemporary art that will inspire any artist or hobbyist. Not confined to just Australian art, the blog also touches on the art scene across the world, including New York and its colourful street art. Its most recent blog post features a list of the 6 most influential people in the Australian art world. Art Guide Australia is your guide into the world of contemporary Australian art. On this blog you’ll find new and upcoming art exhibitions, learn about art galleries and how they operate, find out where your local art gallery is, and read articles on Australian artists and artwork shaping our local art scene. Find out what the top five art exhibitions are this month, read about the highs and lows of winning the Archibald Prize, and get started on collecting contemporary art by following the ultimate guide on art collecting. The Nomad Art Gallery, located in Darwin, specialises in Indigenous art and art collections. Browse limited edition prints from Aboriginal artists in regional and remote Australia, and keep up to date with the gallery via their blog. You can browse their online gallery, find out about upcoming exhibitions, and get to know feature artists. For those in the area, the blog also promotes workshops being held at the gallery, which includes how to make reduction lino prints. One of Sydney’s leading art galleries, Olsen Gallery, represents established artists as well as emerging artists specialising in Australian art, sculpture, prints, and more. The gallery has its own online blog that chronicles events happening in the gallery, including exhibitions, art awards, art showcases, artist interviews and reviews. Looking through the blog gives you the same feel as if you were walking through and browsing the gallery itself. The Juddy Roller network is all about the high-impact visuals and creativity associated with street art. 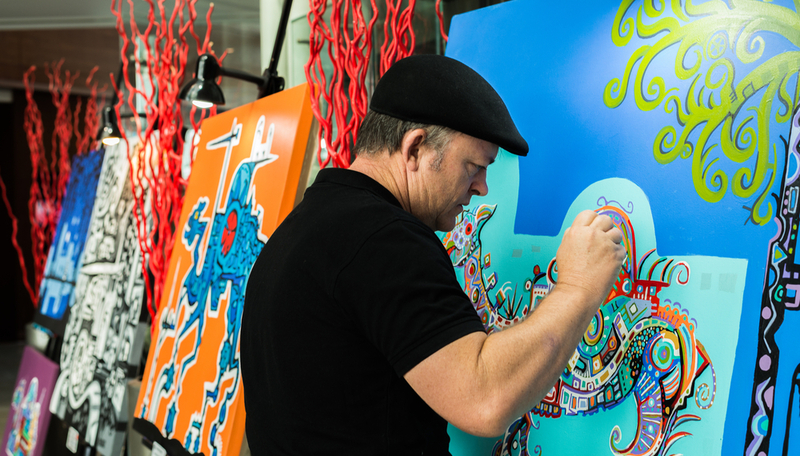 The studio is located in Melbourne, however the online network encompasses street artists from all over the world. The blog showcases new projects, exhibitions, interviews, and the step-by-step process of creating murals on walls. This blog is a vivid catalogue of new, emerging, and established street artists and their larger-than-life creations found in city streets, on silos, and commissioned on public buildings. Have a look at how a rural town skatepark has been transformed into an art installation, how an abandoned silo is now an open-air gallery, and how oils and water colour can create impactive street art. Discount Art N Craft Warehouse carries all of the popular art brands and materials for you to create your own piece of art. If you’re after something specific or aren’t sure where to start on your next art or craft project check out our other blog articles.